I didn't know what to make for dinner tonight. I had some leftovers taht I didn't want to go to waste. I decided to use the glazed pork loin I'd made two days earlier. Normally I shred and add some BBQ sauce, but thought I'd try something different. 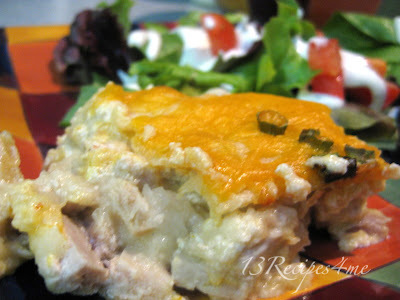 This casserole is based on Mexican Chicken Casserole, only gluten free. Crush bouillon cube and dissolve in 1 TBS hot water. Place 2 cups sour cream in bowl. Add bouillon, 1/4-1/2 cup salsa, green chilies, and milk mixing well. Spray or grease casserole dish. Spread thin layer of sauce on bottom. Place layer of tortillas, meat, onion, cheese. Pour half the sauce over, then tortillas. Repeat, ending with tortillas, then a sprinkling of cheese. Bake at 350 degrees for 20-30 minutes. Serve with additional salsa, and avocado slices if desired.